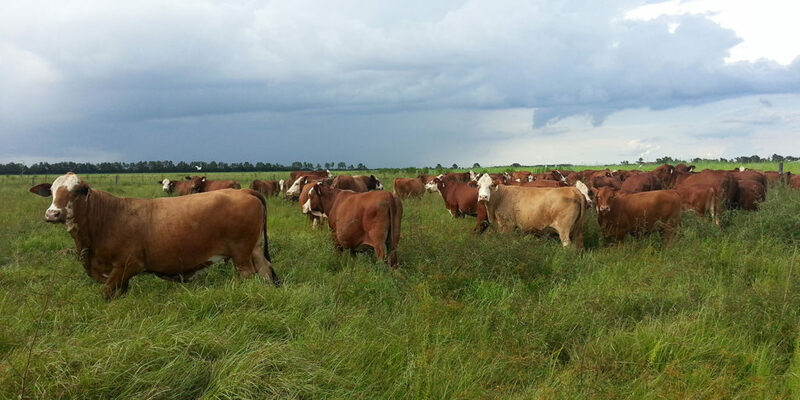 The original cattle were all florida cracker cattle descended from lost herds of Spanish explorers landing in florida. Brahman bulls were later bred to these tough little walking pieces of florida history. After years of Brahman crosses and selecting which ones thrived in Florida’s harsh sub tropical climate it was time for a change. The change came in the from new breeds from Continental Europe, Scottish and England. From these came the new American breeds Braford, Brangus, Beefmasters and several others . We use Brangus, Beefmaster, Charolais, Red Angus and Braford bulls on our cattle and always select those cattle that flourish in our environment. Better to have cattle suited to the environment than try to change the environment to suit the cattle. We have one only one herd of Purebred cattle and they are Brafords at Big Red Cattle . Brafords were started in Florida by Adams Ranch. All our cattle are gentle and trained to work with dogs. Much time is spent selecting which bulls go with which herds . It is now a very scientific process with many selection tools available to us. Our cattle are selected for temperament, feed efficiency and maternal traits. We feed part of our calves with Quincey Cattle Company and are partners in the newly formed Florida Cattle Ranchers group.We are providing Fresh From Florida Beef to Florida families.